We know you would never want to do anything to hurt the Columbia River Gorge. Yet you may unwittingly infect your favorite spots if you're not brushing off your shoes before you set foot on the trails. Inconspicuous seeds from aggressive weeds may be clinging to your hiking boots. These invaders grow vigorously and squeeze out native plants and inhibit ecological diversity. That spells trouble for wildlife, which eat the native plants, and for the beauty of the Gorge as we know it. It's a particular risk in the areas that still are recovering from the 2017 Eagle Creek fire. "Because these plants are invasive and don't naturally occur here, they don't have any predators that eat them and keep them in check," said Emily Stevenson, program coordinator for Skamania County's noxious weed program. "The weeds then produce many seeds that spread and crowd out native plants." "They take over an area, forming a monoculture," Stevenson said. "We want diversity, with flowers blooming at different times so pollinators have something to eat throughout the season, and fruit for birds and insects." Shiny geranium, for example, tops Stevenson's list of targets right now. It grows in both sun and shade, and can produce multiple generations per season. 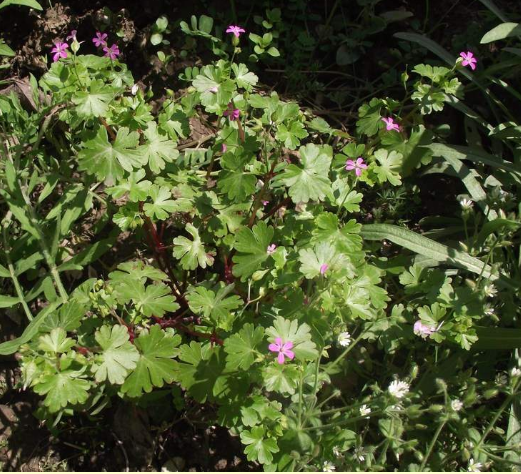 You may well have seen low-growing, small, five-petal pink flower of shiny geranium in your yard. Shiny geranium is common in Portland and its suburbs. A single plant can produce hundreds of seeds that eject 20 feet. Yep, you read that right. The plant is so determined to reproduce that it shoots out seeds that travel the equivalent of two stories, and that's without the help of wind. When you head out for a hike in the Gorge, you may be giving these hitchhikers a lift without even knowing it. That's where boot brushes come in. Perhaps you've seen them at trailheads. They're not just for cleaning dirt off your shoes before you get in the car after your hike (although you should do that, too, to be sure you don't bring home any weeds). They're there for you to brush off any seeds you may have brought with you. It may seem hard to believe that the simple act of brushing off the bottom of your boot can be so crucial for the Gorge’s ecological diversity. But Stevenson, the noxious weed program coordinator, has no doubt. "Boot-brushing can really make a difference," she said. It's a sunny day and you decide to go for a hike. b. Find a boot brush and brush your boots off before stepping foot on the trail. a. Give your boots a vigorous brushing before your put them on and hike. b. Let your dog out of your vehicle, then brush your boots and hike. Erin Middlewood is a writer from Vancouver, Washington. She enjoys exploring the Columbia River Gorge with her husband and two sons. She's especially fond of the Nancy Russell Overlook at Cape Horn. Follow her at erinmiddlewood.com or @emiddlewood on Twitter.